Caring Hands Worldwide worked with other health care providers and faith based organizations to provide free medical, dental, eye, physical therapy, chiropractic, and lifestyle counseling to 1,000 people at the Wheeler Pavilion on the Lane County Fairgrounds on September 26th and 27th, 2015. 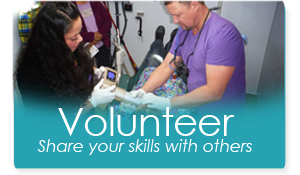 This free health care event included 200 volunteers from across the state of Oregon who volunteered their time for two days. Rainbow Optics from Eugene provided free eye glasses and follow up exams for people in their clinics and worked in coordination with the Casey Eye Van from Oregon Health Science University who provided exams in their mobile eye van. Oregon Eye Care provided volunteers as well to assist with eye dilation and refraction. The Pacific Laser and Cataract Institute and Eugene Eye Care provided free cataract surgeries to anyone identified as needing this surgery during the event. Twenty-five dentists and ten dental hygienists provided the dental services to close to 500 people over the weekend event. Advantage Dental provided follow up emergency care to anyone needing additional care after the event. The event was also organized by the area Seventh-day Adventist Churches and the Adventist Medical Evangelism Network. Plans are already under way to coordinate another Impact Your Health Eugene in October 2016! Impact Your Health – Eugene from AMEN SDA on Vimeo. EUGENE, Ore. — Hundreds of people saw a doctor this weekend at a free health clinic in Eugene. The event is geared towards people without medical, dental, or eye insurance. Local doctors, dentists and nurse volunteered their time, taking over the Wheeler Pavilion at the Lane County Fairgrounds in downtown Eugene. They provided free diabetes screenings, eye exams, and dental exams. Volunteers say this is the first event of its kind in years. The free medical event was provided by the nonprofit organization Caring Hands Worldwide, Rainbow Optics, Casey Eye Institute Outreach Van, and the local Seventh-Day Adventist churches. EUGENE, Ore. – For the first time since 2011, a free health clinic was held in Lane County. Hundreds of people came to the clinic on Saturday to use the free services offered. Seven churches joined together to host the event for up to 1,000 people. “Something that I have dreamed about for a couple of years and so I talked to a couple of local churches and they were willing to do it,” said Randy Meyer, a local area coordinator. Meyer was the mastermind behind the event. He said it took six months to plan. He said he saw a need in the community for the help his clinic provides. “This has been a huge need. The last time we had an event like this was in 2011 with Homeless Connect,” he said. Services included eye care, medical, and dental services. All were provided with the help of medical teams from near and far. “Volunteers in Medicine is here. We have doctors from as far away as Washington, dentists from Seattle who have all come down here to provide this free care today,” he said. A total of 172 volunteers from the community also stepped up to help at the event. They will be at the Wheeler Pavilion in the Lane Events Center throughout the weekend where the event is held. “Oh it feels good. It’s fun to interact with people and see their eyes light up when somebody is going to help them,” said volunteer Michael Gruzensky. Meyers said his inspiration for putting together the event stemmed from his work with the nonprofit Caring Hands Worldwide. He’s now trying to localize the organization’s mission. “It’s an opportunity for them to get the care they need. And for me, it’s meeting their physical and spiritual needs and that’s what we’re all here about,” he said. The clinic will continue Sunday from 8 a.m. to 5 p.m. However, the group will be providing care past the weekend with diabetes education, healthy cooking classes, and free dental care at several churches. Meyers said he hopes this will become an annual event.